Clouds swirl around Jupiter's south pole in this colorful image taken by NASA's Juno spacecraft on Feb. 7, 2018. Citizen scientist Gerald Gerald Eichstädt processed the image using data from the spacecraft's JunoCam. NASA's Juno spacecraft captured this stunning image of Jupiter's south pole during a close flyby of the planet on Feb. 7. The view reveals colorful cloud formations swirling around the south pole along with several white, oval-shaped storms known as the "string of pearls." "This image is one in a series of images taken in an experiment to capture the best results for illuminated parts of Jupiter's polar region," NASA officials said in a statement. 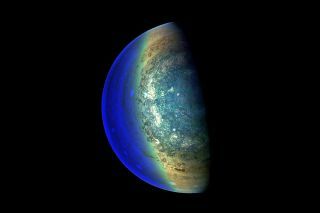 To enhance some of the features along Jupiter's terminator, or the line where day meets night, the Juno team "adjusted JunoCam so that it would perform like a portrait photographer taking multiple photos at different exposures," NASA officials said. The team was "hoping to capture one image with the intended light balance," the officials said. "For JunoCam to collect enough light to reveal features in Jupiter's dark twilight zone, the much brighter, illuminated dayside of Jupiter becomes overexposed with the higher exposure," the officials said. The Juno spacecraft has been taking incredible close-up photos of Jupiter since arriving at the gas giant in 2016. The probe is also conducting research into the planet's weather, composition, magnetic fields and more. JunoCam images are available online at missionjuno.swri.edu/junocam, where anyone can download the raw images and share their own color-enhanced or otherwise artfully edited images of Jupiter.